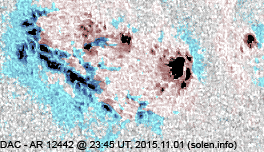 Last major update issued on November 3, 2015 at 04:50 UT. The geomagnetic field was quiet to unsettled on November 2. 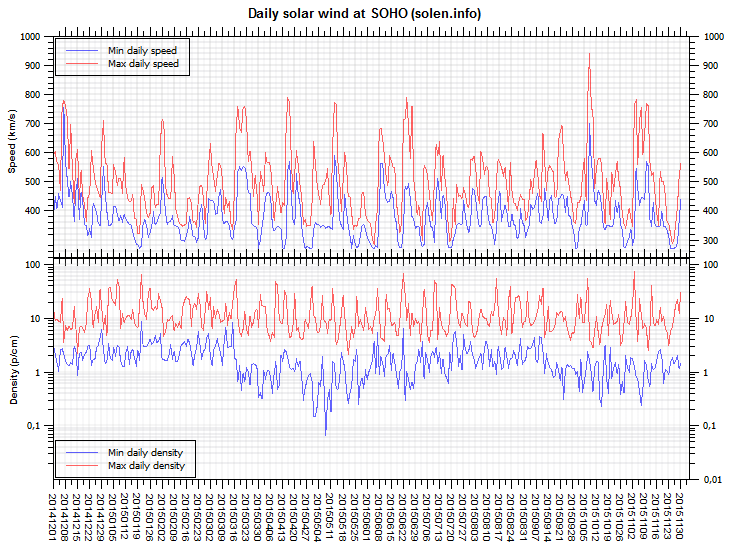 Solar wind speed at SOHO ranged between 286 and 352 km/s. A co-rotating interaction region associated with CH697 was observed arriving at ACE at 22:20 UT, several hours later than expected. Geomagnetic activity has increased early on November 3. 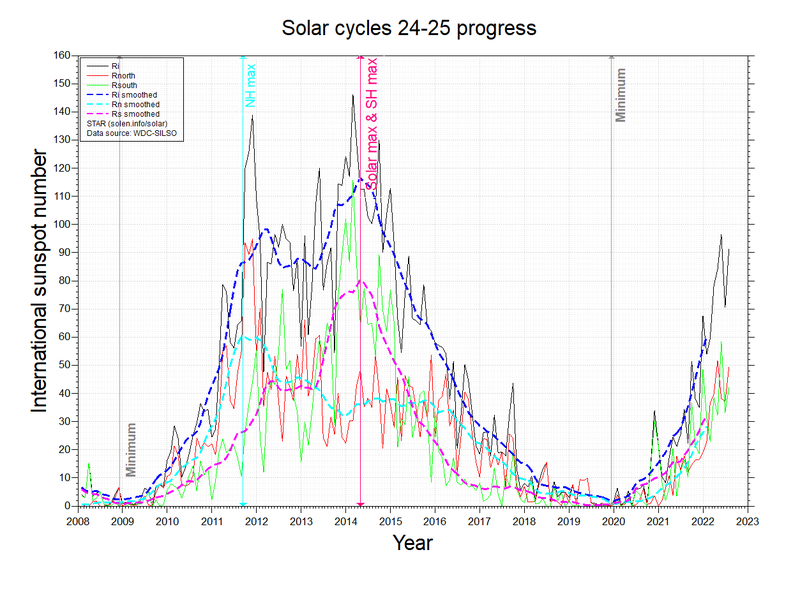 Solar wind density is still increasing and has reached very high levels. The main disturbance associated with CH697 will likely arrive within a few hours. 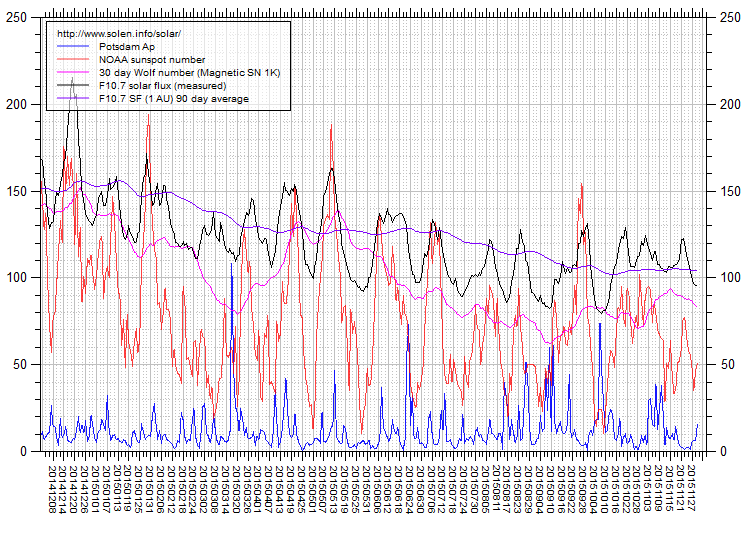 Solar flux at 20h UTC on 2.8 GHz was 122.0 (increasing 40.6 over the last solar rotation). 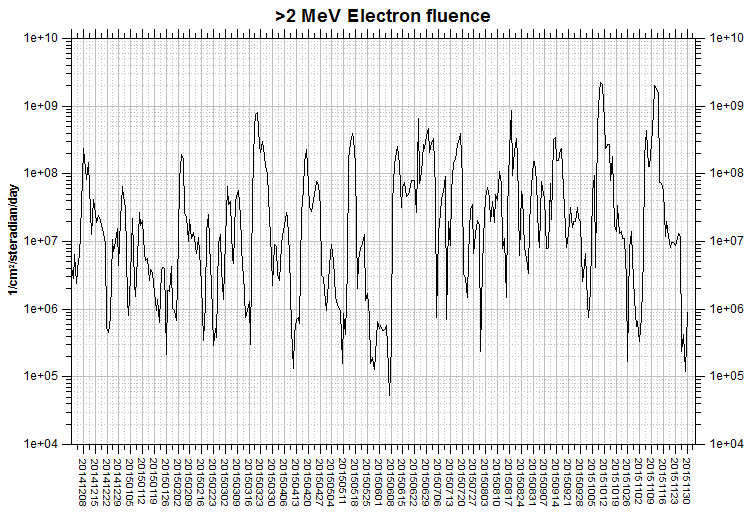 The 90 day 10.7 flux at 1 AU was 105.0. The Potsdam WDC planetary A index was 4 (STAR Ap - based on the mean of three hour interval ap indices: 4.3). Three hour interval K indices: 10012301 (planetary), 10112322 (Boulder). 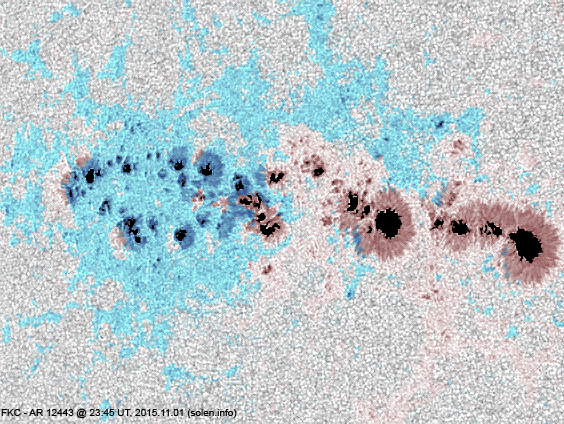 At the time of counting spots (see image time), spots were observed in 6 active regions using 2K resolution (SN: 180) and 6 active regions using 1K resolution (SN: 123) SDO images on the visible solar disk. 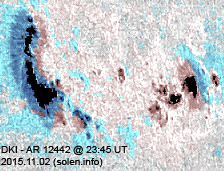 Region 12441 [N14W32] was quiet and stable. 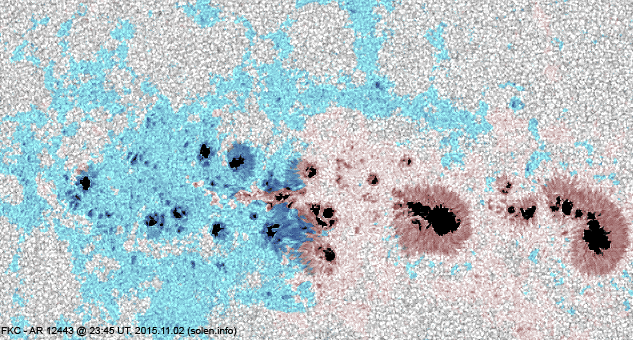 Region 12442 [N16W53] developed in the trailing spot section and decayed elsewhere. The region has minor polarity intermixing and could produce an M class flare. This is currently AR 12445 to SWPC. Region 12443 [N06E16] decayed in the trailing spot section. 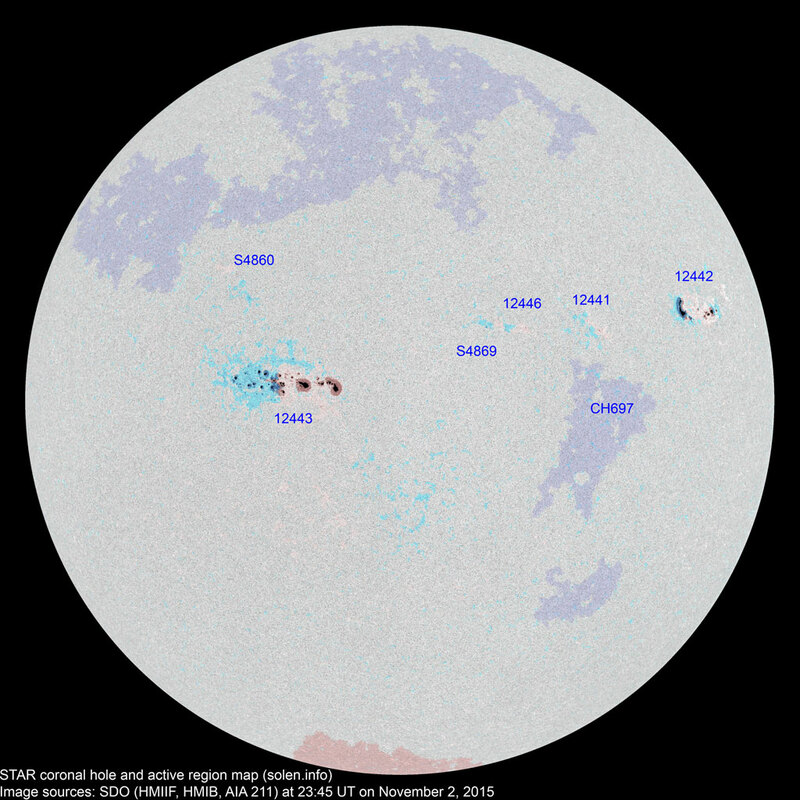 The region produced far fewer flares than during the previous days. An M class flare is still possible. Region 12446 [N15W18] decayed slowly and quietly. S4860 [N19E26] was quiet and stable. S4869 [N15W13] decayed slowly and quietly. October 31-November 2: No obviously Earth directed CMEs were observed in available LASCO imagery. 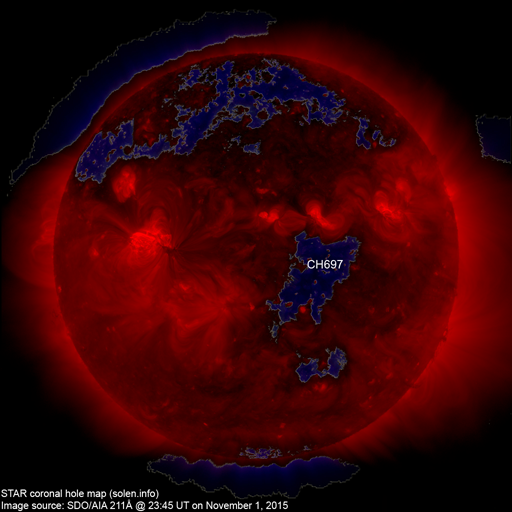 A recurrent trans equatorial coronal hole (CH697) was in an Earth facing position on October 30-November 1. The geomagnetic field is expected to be quiet to major storm on November 3-4 becoming quiet to unsettled on November 5 due to effects from CH697.